At Midshire, we have the full range of Ricoh photocopiers to suit any business requirement, from small desktop multifunction devices to suit small work groups, right through to Ricoh digital presses for production print companies. As a Ricoh Prestige Partner, we work closely with Ricoh UK to deliver the ideal innovative print solutions for our customers’ individual needs. Ricoh is recognised as the world’s leading brand of photocopiers and, as such, are particularly popular in the multifunctional printer marketplace. With a reputation for quality products, Ricoh provides an extensive range of photocopiers to suit to every office environment, including BLI award-winning A3 and A4 devices, mono and colour photocopiers and a wide variety of add-ons and connectivity options. Midshire is able to supply and service the complete range of Ricoh photocopiers available to the UK market, including the latest GelJet printers, which use a special waterproof viscose gel that dries instantly, making it incredibly versatile. No matter what machine you choose, there are many advantages to be gained by investing in a Ricoh photocopier. You can meet your environmental requirements as all Ricoh products are Energy Star rated. The Ricoh brand is synonymous with high quality prints and are regarded as attractive looking devices, that sit well in any office environment. You can also expect some cost savings, as these machines are extremely efficient, with the ability to print, copy, scan and fax from one device, coupled with our cost effective purchasing and servicing options. All Ricoh photocopiers can be either purchased outright or financed on a lease. The most popular method of acquiring a photocopier for your business is through leasing. 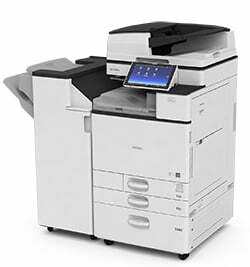 Leasing is the most cost effective method of funding your new photocopier, as you can spread the cost of the equipment over 3 to 5 years, paying fixed, equal amounts either quarterly or monthly. By leasing your photocopier, you may find that you can afford a Ricoh photocopier with a higher specification than you would by purchasing. Leasing also bring tax efficiencies and the ability to upgrade your equipment easier, making it an even more desirable choice for many organisations. As a Ricoh Prestige Partner, Midshire is able to provide genuine Ricoh toner for the full range of Ricoh photocopiers. Genuine Ricoh toner cartridges offer superior print quality, and are designed to ensure the machine produces crisp and clear copies for the duration of its life. With a Midshire Managed Print Service, you don’t have to worry about running out of toner, our OneStop print management software monitors your toner levels and dispatches a new toner cartridge when you’re getting close to running out of toner. As the largest supplier of Ricoh photocopiers in the Midlands, as well as one of the top tier independent providers in the UK, we can offer you the highest possible differentiation and competitive benefits than other print management companies. We also have over 75 Ricoh trained service engineers and technicians in the Midshire Group that service more than 4,000 Ricoh machines in the field.